این مقاله ISI از انتشارات معروف Wiley و از ژورنال EARTHQUAKE ENGINEERING & STRUCTURAL DYNAMICS می باشد که در ژانویه 2015 انتشار یافته است. موضوع این مقاله "پاسخ پیچشی سازه های غیر منعطف با اولین طبقه نرم " می باشد که توسط Key Seng Goh و Tso-Chien Pan از موسسه مدیریت ریسک دانشگاه فنی نانیانگ سنگاپور نوشته شده است و به زبان انگلیسی میباشد. The effects of structural irregularities, such as torsional and soft-first-storey effects, are the critical factors that cause damages in building structures during earthquakes. 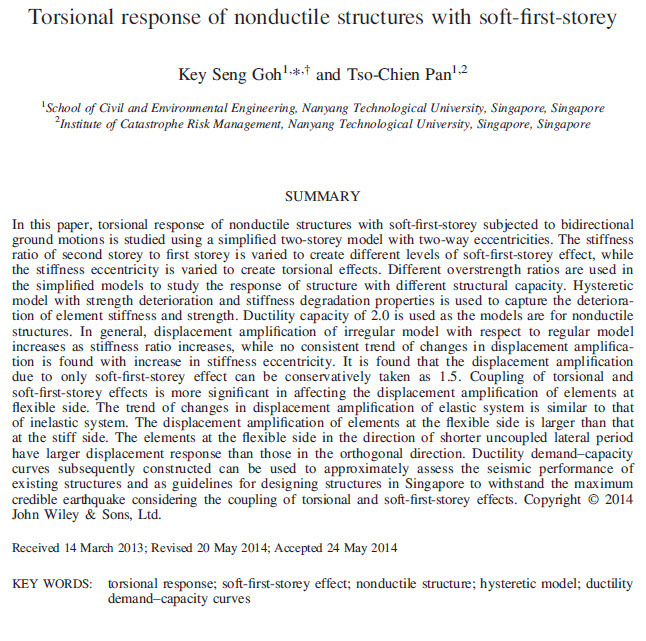 Torsional response is caused primarily by asymmetry in mass, stiffness or strength, while soft-first-storey effect is usually caused by the reduction in lateral stiffness in the first storey compared with the storey above.